Devin shares an article that details New Mexico State University’s plan to incentivize student attendance at football games. Jill Harris talks about the NCAA and shares some academic research on cheating behaviour in cartels. Devin discusses the results of the IOC’s voting on the sports that will be considered for addition to the 2020 Olympic Games. 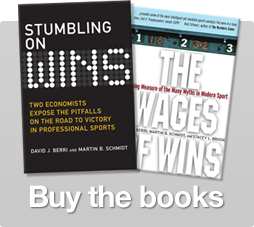 Dave uses the study of sports and economics to help understand why the bonuses given to Wall Street executives were misguided.